I honestly have never liked zucchini. I hate how mushy it gets, and the flavor really isn't anything to write home about. The worst is... that pile of zucchini and yellow squash chunks some restaurants spoon onto your plate as a side of veggies. Seriously? That's the best you've got?! Eww. Eww. Eww. 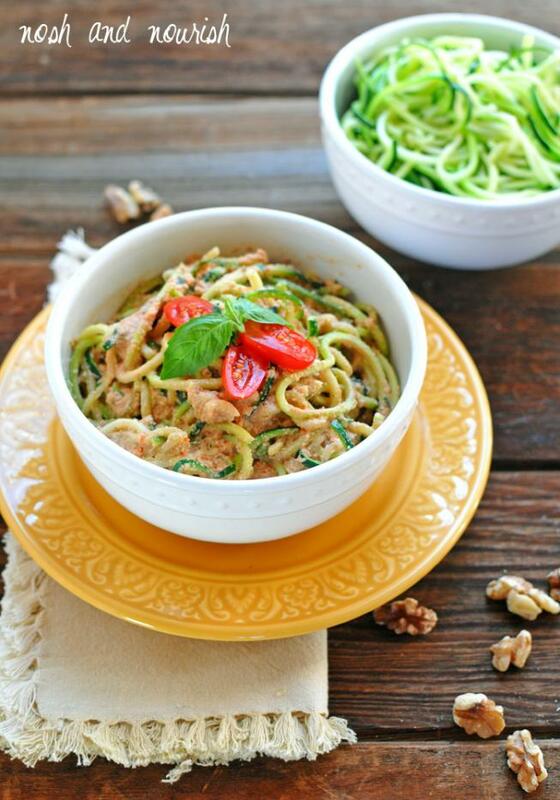 BUT, my opinion of zucchini was drastically change by a certain new kitchen tool: the spiralizer. This handy dandy contraption turns any (most) vegetable into little pasta-like noodles. Genius!! I saute them in a little bit of EVOO, and they get softened but not mushy. And they really are a great noodle subsitute!! Especially when topped with a fabulous homemade red pepper alfredo. The base of the alfredo is a combination of roasted red peppers, soaked walnuts, veggie broth, and spices. 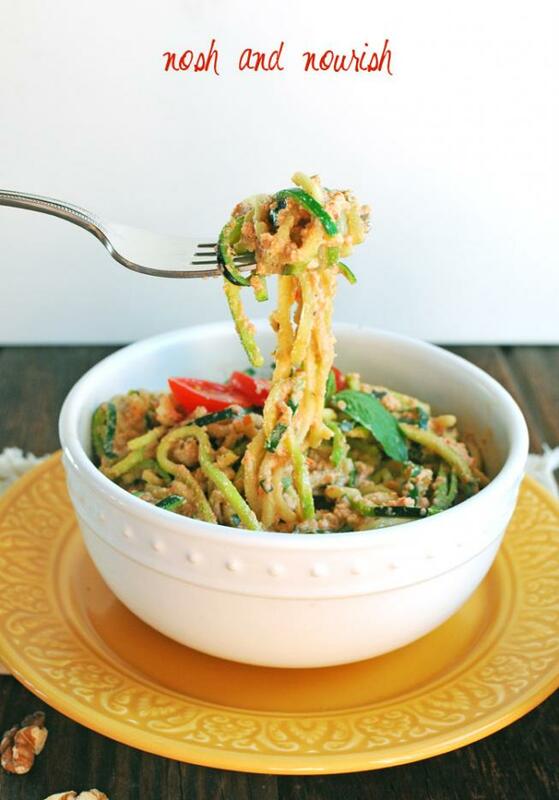 And the "money" shot --- twirled zoodles on a fork!! Go ahead, you know you want to take that bite. 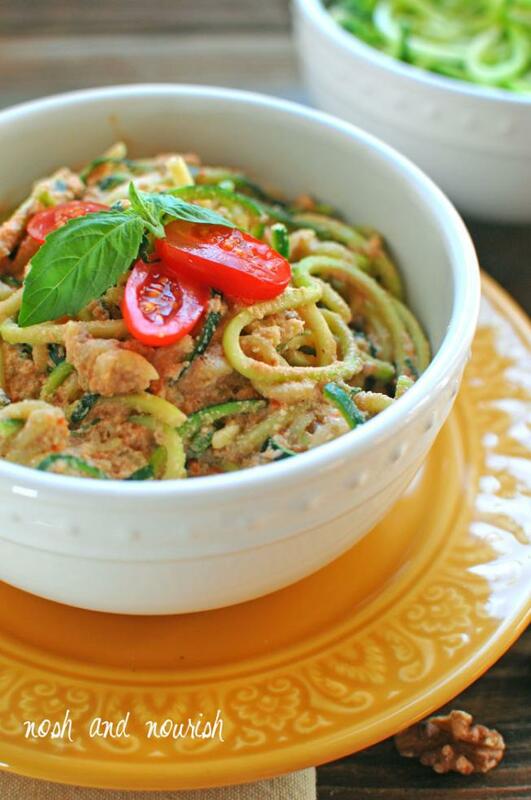 And these "zoodles" (zucchini noodles) are sooooo much better for you than regular pasta!! They are packed with vitamin C, phytonutrients, and minerals like manganese and potassium. 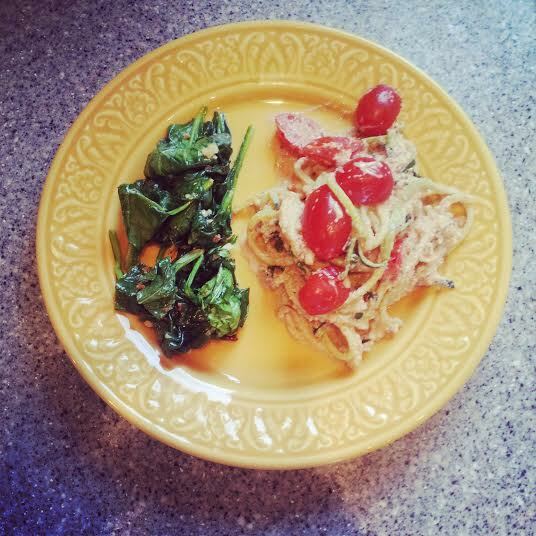 I upped the health factor of this meal even more by serving the alfredo zoodles alongside some sauteed greens. My favorite is a combination of spinach, swiss chard, and baby bok choy with a little minced garlic and olive oil. You can see my day-to-day meals (like this one) on Instagram. What do you think of zucchini? 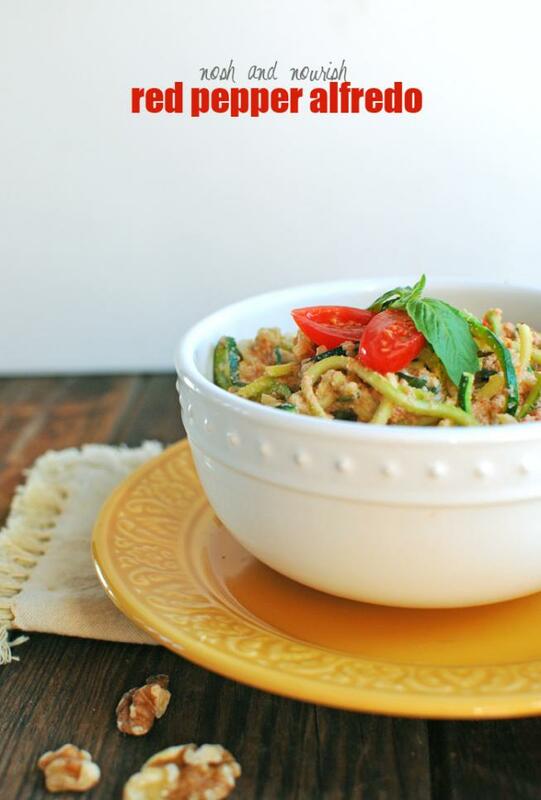 Where to get more spiralized recipes: My friend Ali has an entire blog dedicated to recipes using the spiralizer!! Check her out at inspiralized.com. Soak the walnuts in 1 cup of water for 3 - 4 hours. Preheat oven (or toaster oven) to 425 degrees. Remove stem and seeds from bell pepper, then chop it into 1 inch chunks. Line a cookie sheet with aluminum foil, then place the peppers with the outside skin facing down. Roast for 25 minutes. Peppers should be soft and slightly browned on the bottom when done. Drain the walnuts from the water they were soaking in, and combine the walnuts, roasted peppers, tomatoes, and veggie broth (or chicken broth). Use an immersion stick blender to puree, until smooth. In a small pot over medium-low heat, combine the pepper puree and the white balsamic vinegar, basil, oregano, garlic, and coconut sugar. Stir frequently until it is warmed through. Spiralize your zucchini (I left the skin on mine, but you can peel first if you prefer). In a large skillet, saute the zucchini with the olive oil for approximately 4 minutes. The zucchini should be warmed and slightly softened, but not mushy. Then add in the warmed red pepper alfredo, stirring to coat each noodle. Serve immediately with sliced grape tomatoes and sauteed greens (optional).